There are many things an irrigation business needs to do. They need to answer the phone and get customers on their schedule. They need skilled technicians to service customers. They need a billing system in place so invoices do not slip through the cracks and they can get paid. On top of all of those things, irrigation and landscaping businesses also need to promote smart irrigation. There are a number of benefits for your business, your customers, and the community you work and live in to promote and service smart irrigation. Offering smart irrigation is a great way to promote your business. Many consumers are looking for ways to ensure their purchases are helping, not hurting the environment. With recent news about global warming increasing, and humans becoming a rising factor for this, why wouldn’t you promote ways you are helping the environment? Many customers actually seek out those that promote themselves as “green”. Smart irrigation is one more way to reel in customers who are looking for a “smarter” solution. You will also be able to promote and offer something a lot of competitors can’t or won’t. It is an ideal way to stand out from the competition by offering services that can benefit more than just the customer. And if you don’t, you may actually fall behind your competitors. According to our Green Industry Equipment Report, nearly 75% of irrigation professionals responding to the survey said they promote smart irrigation. Do you want to be seen as the backwards irrigation professionals that hasn’t hopped aboard the smart irrigation bandwagon? If your customers do not rank being “green” high on their list when looking for a contractor, perhaps you can offer them a cheaper water bill. Everyone loves to save money and it’s a great way to promote that you offer smart irrigation. Their taxes will also go down due to minimizing the need for investments in infrastructures that store and carry water. With smart irrigation, water is only distributed when it is needed and only as much as is needed. Their water bill will decrease due to restraints on inefficient watering. They also have the benefit of not needing to do as much work to keep their lawn looking green and healthy. The smart controllers take in to account soil moisture to determine if the lawn should be watered. It’s an automatic process, allowing your customers to skip watching the weather and turning on and off systems. 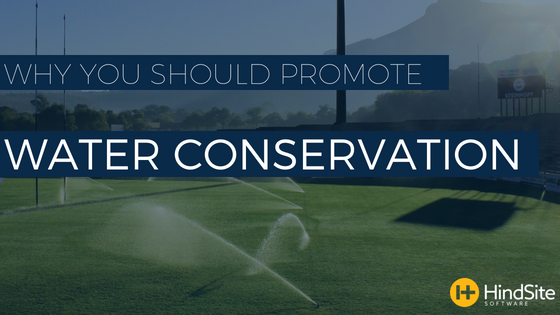 If all of the above didn’t convince you why you need to promote smart irrigation, how about the simple fact that you and your business are doing your part to help conserve water and better the environment? If all else fails, you deserve a pat on the back for working to make your community a better place by keeping lawns looking healthy and green, while thinking of the environment the entire time. Smart irrigation is a great way for your business to promote its services and to stand out from the competition. Customers will love that their water bill will become lower, and you have a way to market yourself that can bring in more business.